Last summer, we watched with sadness in our hearts as the Goon found out exactly what his parents were afraid of — other kids expect him to follow the typical gender patterns. His choice of a pink backpack as he prepared for kindergarten just wouldn’t fit in. The reaction of kids around him didn’t surprise us — but it was no less upsetting for being expected. When I told the backpack story a year ago I was amazed at the response. The story resonated with many, many people. The response affirmed my deeply-held belief: the world is a wonderful, diverse place. While we may assume that there is no one else facing the same challenges that we do… we are not alone. People around us — everyday — step away from the norm. And they struggle, too, as they swim against the tide. Knowing that others face the same societal pressures as your child is one thing. Standing resolute as he faces yet another test is something else. Which brings us to Chapter Three in The Goon’s Journey. The Goon’s kindergarten year progressed as the Queen and I expected. He made lots of friends (the best friends all girls), charmed his teachers, and made it easy for his parents to pick out his projects at every Open House — his color motifs were always pink or purple. And in the spring, when he needed a new pair of sneakers to replace those he had so quickly grown out of, he picked a pair of pink low top Chuck Taylors. Classic Goon. Things were great — for a month or two. Then the Goon started complaining that his new sneakers which he had proudly shown off to anyone who’d asked hurt his feet. They didn’t fit right. He couldn’t wear them anymore. The real reason once we got him to share it was exactly what you’d expect. On the bus one day, some older kids had made fun of the quiet, sweet little boy with the pink sneakers. There it was. My path forward through the Goon’s story. He felt better knowing that he wasn’t alone. Someone was on his side. He couldn’t read all of the comments left by readers of my other stories. The concept of other unseen people struggling as they too balanced being themselves against society’s currents — far too abstract for a 5 year old. But someone standing next to him, on his side? That made him happy. I thought about this for a while. I’ve defined my position clearly. I know that I can’t stand between the ugly parts of the world and my dear boy. But I was damned certain that he’d know that I stood with him. The smile on his face at the question was immediate and uplifting. “Sure!” he said. In that moment, the score was Dad: 1, Ugly Side of Life: 0. So I am the proud owner of a pair of pink low top shoes. Pretty spiffy, if you ask me. The Goon’s pair, which had been thrown into the back of the closet, got pulled out and put back into rotation. The Goon and I look pretty cool as we rock those pink masterpieces, side by side. If you bump into us while we’re sporting them, tell the Goon you like them. As I’ve learned from Ken over at Popehat, the very best way to counter bad speech is by more — better — speech. Let the bullies say what they will — the Goon will be happy to hear that someone thinks his sneakers look cool. So that’s where I’ll end this chapter. I’m just a guy. I can’t change the world. But I can stand next to him as a reminder that his dad loves him and thinks he’s great just the way he is. My question to you is this: how do you support the people around you — especially those who need it? Please don’t think I’m referring only to those that challenge gender roles. I’m sure you have those in your life that are challenged with being different. Do they know where you stand? And while you’re standing there, what color are your sneakers? Y’all look spiffy in your sneakers. Today I’m wearing my boring black & purple Nikes but I have some super neat Batman Chuck Taylors. Some people think girls aren’t supposed to like Batman and boys aren’t supposed to like pink. Those people are just flat wrong. Always wear what makes you happy. I can’t improve on that! Thanks for commenting! I never thought at almost 50 I would still have to deal with the bullies on the bus, but it happened. Still hurts!! Thanks for the great read. Know that you are loved more than before! I’m sorry that you continue to hear hateful words but I would point out that you are a person that is loved as well! Really amazing story and so inspiring. Thanks for sharing and for supporting and accepting the differences that make a person unique. know that you are strongly admired and respected. God bless you and yours. Those are incredibly kind words. Thank you for reading and commenting! I’m a little jealous to see a boy who’s father stands with him as you do; I have seen it before in cases of disability. Extending that out to friends, even enemies seems what religion might be about. Perhaps Jesus got that kind of support only from the father. My son palys with his cars in a pink doll house…. Loveis love and you area GREAT DAD!!!! My son’s favorite colors were pink and purple throughout daycare and pre-school. By the time we hit t-ball practice the summer before Kindergarten, the other kids teased him, and he no longer wanted to play with his pink and black glove. I wish we would have boughten his dad a pink glove, too. He now rejects all things pink and purple. Even Hello Kitty, his chosen them for his 4th birthday party, has been stricken from his toy collection. Thanks for sharing, Todd. That’s a sad story, Laura. But I appreciate you sharing it. Thank you for being an awesome Dad. I have three sons that march to their own style. Two are now adults and one is a teenager. I have surrounded them with loving role models that march to their own drummers and encourage my boys to be themselves. All we can do is support and love…. respect and honor. you are on the right path. 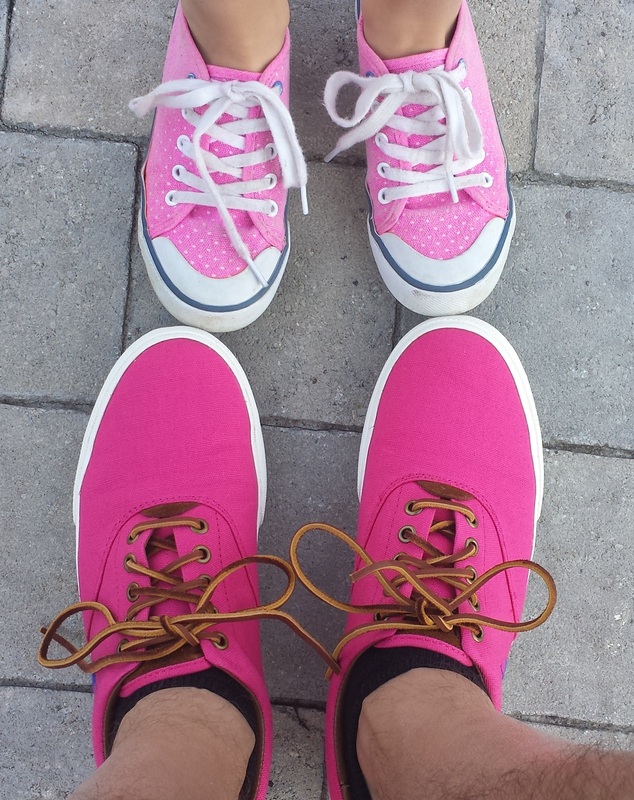 Where did you get the hot pink sneaks… those are way too awesome! Thanks! I ended up ordering them online as I couldn’t find anything locally. This is a wonderful story- I too have a 3 year old. Several weeks ago we were tye-dying a shirt for him and he wanted the main color to be pink. I shamefully hesitated for a minute, but then made a large pink stripe down the middle of it. If he likes it, he should be happy. After your story, I looked up the color pink as I think people are drawn to particular colors for reasons. The color pink generally denotes compassion, nurturing and love. It relates to unconditional love and understanding, and the giving and receiving of nurturing. It sounds like your son is going to be a wonderful human being full of love. I hope both of your sets of shoes inspire more understanding and nurturing in the world. Believe me — I know how scary that feeling is when your child looks for you to validate their choice. But I think it’s the only true path forward. We stand with our children. Thanks for reading and sharing your story! Awesome story Todd! What a great message to share! Your son is so lucky to have you and you to have him!!!! THanks for sharing! in the 80s while i was going to college i ran across a pair of size 12, neon pink, chuck taylor high tops which i immediately bought and began wearing pretty much everywhere. at the time i was 6′, 240 pounds, with dark hair halfway down my back, and a long dark beard. i was a leader amongst my social circle and when one acquaintance began to give me grief about it, some of my friends stepped in to make sure he knew he was being “way uncool.” even today when my school chose a bright pink t-shirt for field day and the other male teachers on my campus refused to get on, i wore mine happily because i’m comfortable with my sexuality (bisexual but in a monogamous marriage to a woman) and i love bright colors. to put it all together i think you are a hell of a dad and on your way to raising a hell of a man. you go! Thank you! Hard to imagine that someone would give you a hard time but I think that’s an example of how strangely powerful this cultural norm is. A) From all accounts, you seem like a pretty awesome dad. Your son is lucky, and vice-versa. B) Our close friends have a pair of 5-year-old twins, one boy, one girl; from the age of 2, the boy has wanted to wear dresses and the like, and, along with their own internal struggles, they’ve supported him every step of the way. It’s what makes him happy, how he sees himself, and really doesn’t define him in any way other than complement his own sense of being. They are also awesome parents. C) We just got back from a summer spent in Europe, and let me just say that you and your son would fit in perfectly! As it is, I clearly need to increase the salmon and pink in my own wardrobe if I want to fit in with the other men over there. They’ve got fashion down pat, and pink is clearly a vital part of the spectrum. In short: keep rocking it out! Thank you for those kind words. I read you loud and clear. I’m going to go tell the Queen (aka Mom Girl). We need to take a trip to Europe!!! It’s silly, right? The color means only what we’ve “decided” that it means. Aw, I wish I could post a photo of my 5 year old son in his pink hello kitty rain boots. We totally support him wearing whatever he wants and I feel lucky that we haven’t had to deal with the social impact quite yet since he goes to a small co-op school in a very liberal area. I love reading your story since I suspect we will be struggling with the same thing next year when he heads off to public school. Rock on with your beautiful pink shoes! Thanks — and good luck to you next year! I’m a dad of a 3 year old who loves pink and sports a pink tutu regularly – to school, camp, and all around Brooklyn. It’s definitely gotten easier over time to encourage him to wear what he wants and to be proud of it, and we’re both happier when he does. Truth is, he gets more compliments when he rocks the tutu than anything else he wears. It’s good to see other dads in relatively similar situations. When the Goon was younger we tried offering other options to his choices. The more we stalled, the more upset he got. Then we stopped fighting and we’re all happier for it. I know how you feel! Can this planet please have more parents like you? It would solve so many problems. Ha! Well, I can’t argue with that logic! Thanks for reading and sharing your thoughts. I am glad to have stumbled across your post and blog. I too write about some of the same issues, so it’s nice to read other perspectives. Our son is starting first grade in a couple of days, and is excited to rock his rainbow shoes and pink headband. I’m guessing over half of his clothes come from the girl’s section. He’s been mistaken for a girl but each time shrugs it off and stays true to his style choices, which really impresses me as his mum. It is good to know there are so many supportive and loving parents out there. Cheers! His reaction is awesome. He knows who he is and is comfortable with it? You’re doing a great job as a mom! Your article really struck a chord with me. It is do great to see you supporting your boy as a father should. My boy J went through a similar thing. He wore costumes, mostly of female charecters, for most of his third year. Dorothy Gale was his favourite. One day in a store he frll in love with a Tinkerbell costume, fairy wings n all. He and I later went and proudly bought it. He was so happy. Thanks for blogging these experiences! Even though you know you’re doing the right thing, there’s always that nagging doubt based on what other people are going to think. It’s been helpful for the Queen and me to know that we’re not the only parents in this position. Thanks for sharing your son’s story! Thank you for sharing, and kudos to you for supporting your kid they way you do. I just read through your other, related posts (getting there from BoingBoing). It’s not the first story of the kind I read, and every one of them really got to me. I don’t have any kids, but I do know what it’s like to be different from the rest. It’s heartbreaking to hear what kids and families have to go through just because of stupid social norms that are, when it comes right down to it, totally unimportant. Why do people care about stuff that other people like? It’s not going to change their own life, so why make such a big deal out of it? In any case, as you said in another post, the other kids can’t be blamed (apart from the bullying, there’s never an excuse for that); they just mirror the society in which they grow up—which is what makes the situation so sad. Instead of encouraging kids to show respect, tolerance and kindness, they are brought up to belief that they have to fit in or not be worth the trouble. And that it’s ok to pick on anybody who is not desperately trying to fit in. Oh yeah, and as for living in Europe, as somebody else pointed out: Yes, over here it’s ok for guys to wear pink, nobody looks twice or even automatically assumes they’re gay. Hell, a guy can even go shopping with a basket (something my American friend tells me you would never see in America 😉 ) But I’m not sure a little boy who is into pink and girl’s stuff would have it any easier. Kids can be cruel, make no mistake. No worries — comment away! It’s great to know that other people are out there and support the decisions we’ve made. I appreciate you taking a moment to read and share your thoughts. Thank you! Thanks for the inspiring story, I was crying reading it. Good job supporting your little guy and sharing it with the world. Thanks for reading and commenting! I think you’re also demonstrating that behavior that we need more of in the world — talking to your daughter and acting in accordance with your beliefs. Good for you! I like your pink shoes! Chucks are a classic, but I’ve always had navy, red, or gray. Maybe I’ll get pink next. When I was five or so, my mom took me to get a new pair of sneakers. I immediately gravitated towards black Darth Vader sneakers (with fancy Velcro) but the salesman said, “Those are boys shoes. Don’t you want these Princess Leia shoes?” I looked at him and said, “Leia didn’t wear pink and neither do I.” I walked out of there in my Vader shoes next to my very proud mom. I suspect that if they’d had adult-sized Vader shoes she might have worn them too. Leia is badass! Who can deny that? Thanks for sharing! I’m a 29 year old dude, a professional cyclist messenger in NYC, and I wear pink chucks every single day. Right on, Goon! Rock on! Thanks for stopping by! as a grown man who loves pink i am luckly that my son also loves loud colors that dont fit with the “norm” of a fourteen year old boy. and when i told him about this article he read it and agreed with me that your shoes are sweet and need to know what brand are they. Awesome — thanks for asking! I looked locally but couldn’t find anything pink so I ended up ordering them online. They are Polo Ralph Lauren Vaughns. Nice shoes. Rock on Goon and Dad. How do I support people? I tell them to ignore haters, because those attitudes have got nothing to do with you personally – they’re just projections of the insecure. Thanks for reading and sharing your perspective! I heartily approve – rock on! Love your shoes, love how you are raising your kid. Hi there, I just want to say that you are “Super Dad” to me. Like a super-hero you are mighty enough to protect your son from harm, but also to love him unconditionally! Your cape of courage is what makes this world a better place and the kindness in your hands and in your heart is why sometimes I let myself hope again. I have to admit I’m a bit jealous of your son, having a father like you would have been a dream come-true for me! My dad told me one day that being me would get me hurt. He said that people don’t like those like me, and that it was best to just wear what everyone else was wearing, keep quiet, and not socialize, because if they ever figured out what I was, I would get to know pain. I still remember his words to this day, and even though they saved me from many things, I wonder what I could have been if I were truly free to be myself. Thank you again for being Super-Dad, you are one awesome character I would truly love to meet. Boy — that is hard to read. I appreciate you sharing. I’m sad for you that you weren’t supported in being yourself. I hope you’ve found peace since then. We are just starting to deal with this right now as our son has just started Kindergarten and gets so much joy out of pinks and dresses. He is currently “growing his hair long, like as girl” which at this point needs a hair barrette to keep it out of his eyes and we are so worried for those first destructive comments to come at him. He also loves wearing dresses and are really not sure how to let him be himself and also protect him from the world. I guess I (his 6’5″, 240lb dad) needs to go out and find a nice skirt! Thanks for your posts, they have been a good read this evening. Good luck with your son’s journey! Thanks for stopping in. I LOVE The Pink Shoes, Guys! After “Green” (Which Made Me Start Thinking Our Little Fella Was Colorblind…Nah, Just Young), HIS favorite Color Was Pink……We Bought His Clothes In “The Girls Area”….We Had A Niece Would Loves Cars, We Have Great Nephews Who Love PINK and A Granddaughter Who LOVES cars….We Support Them All….And As They Change. What A TERRIFIC DAD you Are….great Choice In Shoe Colors. You get it. Thank you! Hey! My son is now almost 14. When he was 3 (and his favorite color was gold) he discovered the wonder that was My Little Pony. He didn’t exactly know what to DO with them, because he hated brushing their hair (they come with brushes) but he thought they were adorably cute. This lasted for several years and each time we were in a store with toys, he wanted to look at the ponies. One day an older boy came by and said, “hey! that’s not the boys’ aisle.” I tried to say that there was no such thing, that we could ALL look at ALL the toy aisles, but there was no stopping this kid, until his macho dad called him away from my arguing. My son’s head drooped and he said, “suddenly I feel really, really sad, and I don’t know why.” My heart broke. He did continue to play with his ponies, but he mostly kept them a secret from his friends. Nowadays he refuses to even ADMIT that he ever owned them. On the other hand, he still has a thing for jewelry and blingy things. 🙂 And has very recently expressed an interest in a girl at school…so here we go. New things to learn for us all! Wow, there is so much there that feels familiar. I appreciate you sharing your family’s story. And likewise! Thanks for sharing and being a super-awesome dad. There’s only so much leverage a mom has in these situations. He was a Broney before it was cool! I know, right??? I told him about it when I found that some of my students were Bronies, but he didn’t want to admit his pony love even then! You need to share a link on where to buy those awesome pink shoes you are wearing. Well, maybe not “you need,” more like I need you to. Thanks Linda. I think he’s pretty great! Thanks for reading and commenting! Great post and great parenting!! I have a son who doesn’t dress different but has some behaviors and interests that are not the ‘norm’ and I worry every day about bullying. You post made me smile, thanks for sharing!! Thanks for taking the time to read and comment! I hear you – I think that it’s much easier to be brave for ourselves than it is to be brave for someone we love. Wonderful post – I’m the mom to a kid who marches to the beat of his own drum in many aspects of life. And as his mother I’m always dealing with the push/pull of supporting/encouraging him to be him and wanting to protect him from those who take issue with anyone who doesn’t follow the crowd. It’s hard to find the balance there! Thanks for sharing your story. Kids can really be cruel now a days. Goon you keep on being you. I’m proud of your dad as to how he is by your side well so I’m I. We have to stand up to ugly people of the world. Hang in there and again JUST BE YOURSELF.